Do you remember it from last year? It went down in flames for me. One pair finished, two pairs that didn’t fit. And then the post that ended it all for me. I seriously stopped knitting. I stopped knitting altogether for awhile. Absolutely unheard of! The whole experience was so frustrating. So imagine the collective surprise of my friends when I suggested doing it again this year! Look, the fact of the matter is that I love knitting socks. And I have a lot of sock yarn. A lot. Though a lot less than last year. And much of my sock yarn is “too pretty to knit” so I don’t knit with it, I just admire the skein. I really want to break out of that habit. I want to knit with my pretty yarn, and I’ve discovered I really like super long socks. So I do need another month o’socks and we are just going to go for it. As a kick off, I am showing you a pair that I’ve been working on little by little over the past couple of months. The yarn is Shibui, I used it for mystic light shawl and had some left over. 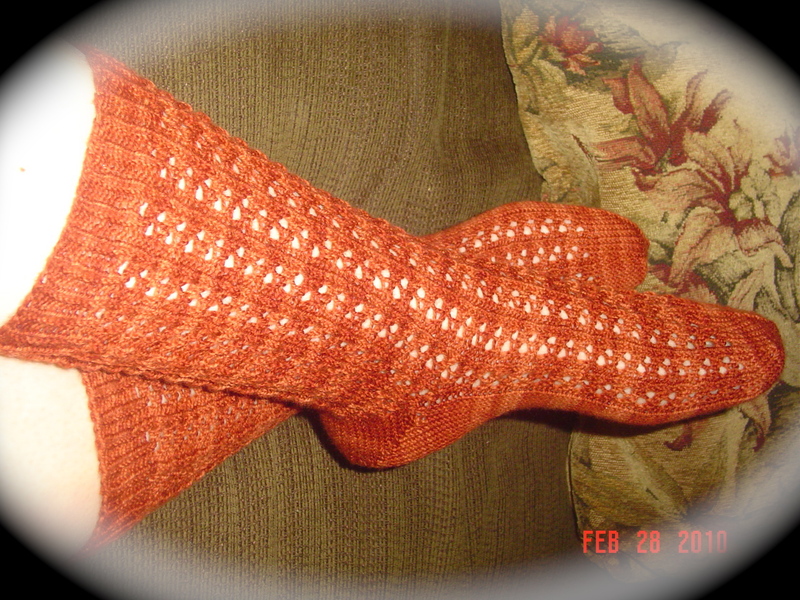 The pattern is from Vintage Socks, but I just took the stitch pattern and made my own sock. The fact of the matter is, I knit faster now than I did two years ago. I completed this sweater in 8 days. It helped to have 2 weekends in which I did little else but knit. But even with full work weeks, I was able to finish this sweater in record time. I must say I really love the sweater in a big way. So much so that I am ready to start another. I’d like to lengthen the whole thing to a tunic length sweater, I think it would turn out very cute. 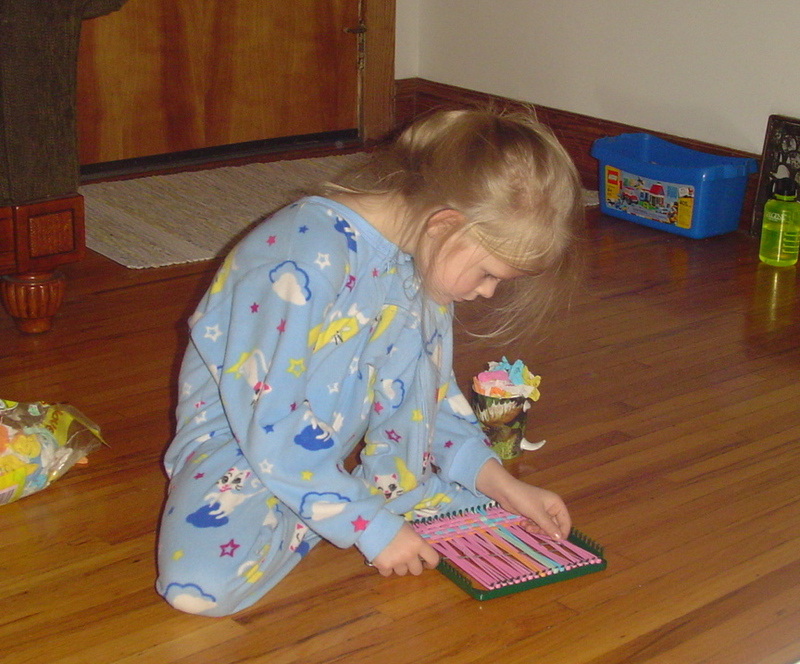 During the weekend when I was knitting almost frantically on this sweater, we would turn on the olympics for awhile and Bug would get to work on her potholder loom. She has gotten quite good at it and does not need my help at all. I am well into the sleeves of the cardigan now. It is just amazing how fast knitting can go when I am concentrating on just one project. Person standing waiting for elevator makes quick but scary comment to passerby. And I promptly fall apart laughing. I wanted to give you an idea just how big this cardigan has become already. So I stretched it out. 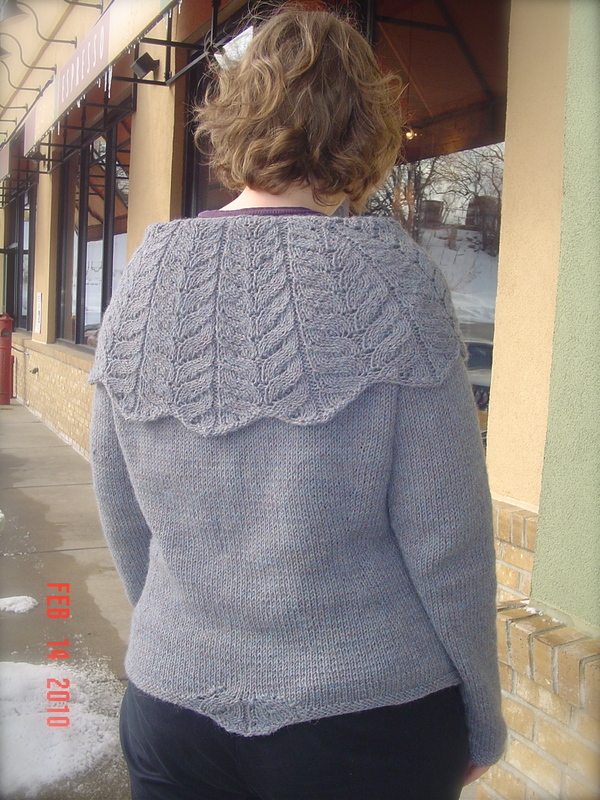 What you are seeing is a cardigan knit in one piece, so it is the fronts and back together. 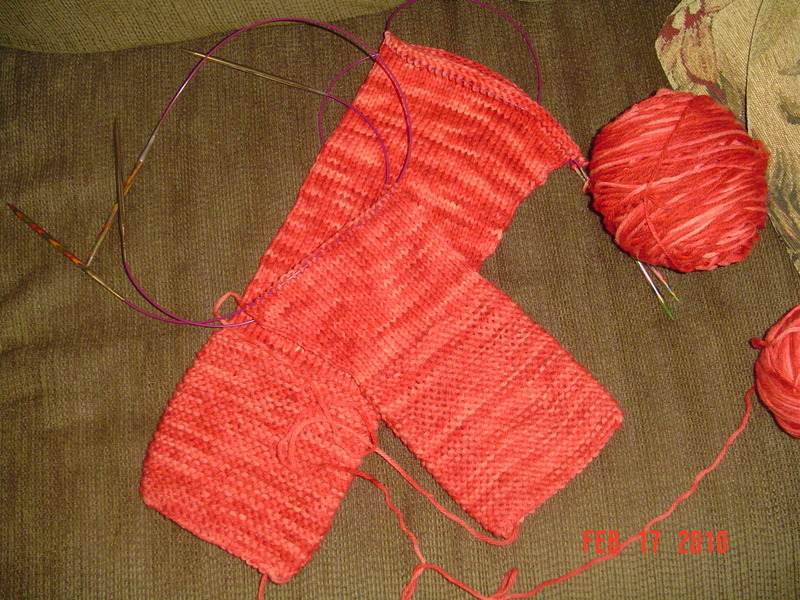 I’ve also done two cuffs, even though I am not yet to the sleeve portion of the pattern. They were just smaller and easier to carry. It has gone quite quickly so far, but I am about to experience a major slow down. This week is busy in general, Bug is still not feeling well, I am still not feeling well, and thus we should be attempting to get some rest. Rather than obsessively knitting on something to all hours of the night. Again, this is NOT the color of my sweater. Sorry. 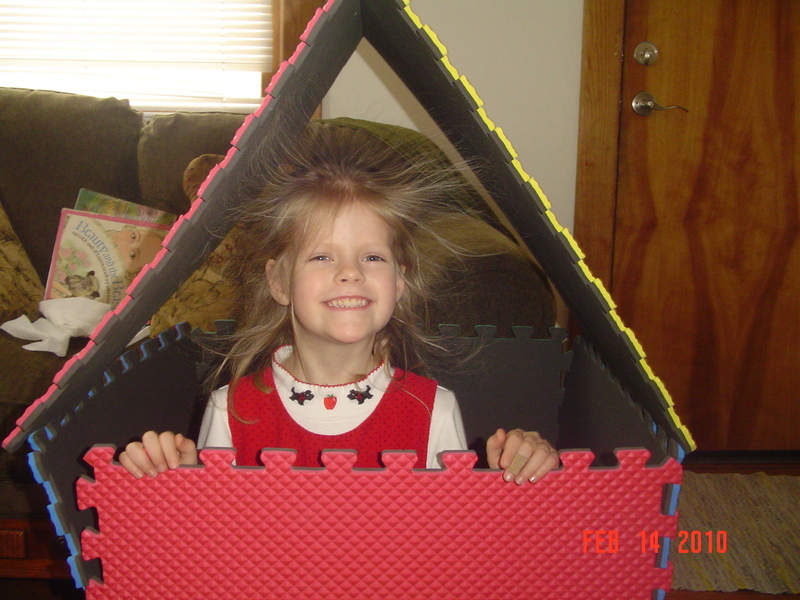 So, now I leave you with a goofy picture of Bug, who created a “doghouse” for herself this weekend. 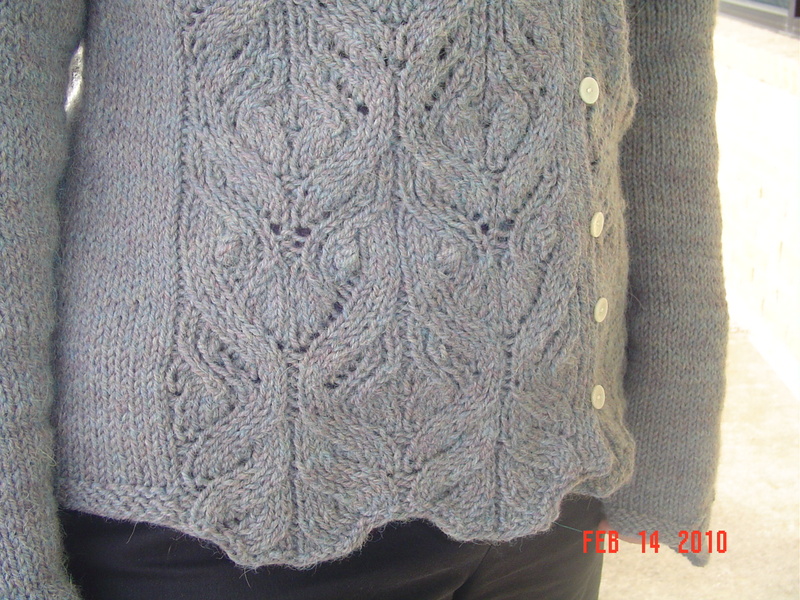 I may have mentioned that I finished my Kelmscott cardigan about 2 hours before the start of the knitting olympics. It would have never happened except that Bug got sick and we had to stay home on Friday. 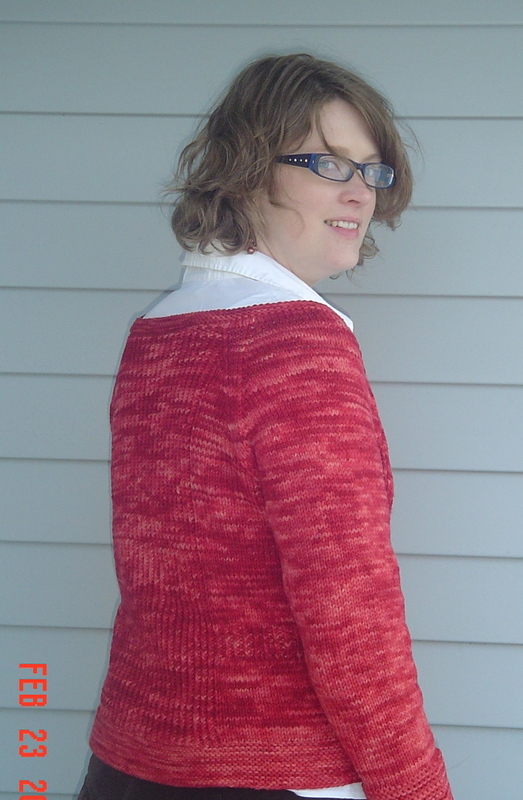 I was quite nervous about a couple of issues with this sweater, but in the end it all turned out just fine. I did have to make a few modifications. First of all, I knit the bulk of the cardigan in stockinette rather than reverse stockinette. Additionally, there was a problem with lack of yarn. I had about two yards left over once I was done with the knitting. Just enough to piece the whole thing together. So I was not able to work the crocheted buttons or the crocheted finishing. I just could not justify purchasing an entire new skein of yarn just for the edging and a few buttons. So instead I just added mother of pearl buttons and called it done. The sleeves are a little bit long, but it did turn out quite well. Day 1, less than 24 hours in. I’ve cast on my knitting olympics project. I had a bit of a false start, assuming when tv guide told me the ceremonies were beginning was the time the ceremonies were beginning. But I should have known better. There is always hours of interviews and pretty pictures first. So I had to restart. Once the ceremonies began, I was off! The project is Amelia from knitty.com. The yarn is leftover cascade 220 in yellow, overdyed by bunkybobo. I am so fortunate to have a friend who can do such things especially when I don’t have the motivation or courage. The overdye in red left me with deep shades of red along with a peachy/salmony tone. It is quite pretty! I have one skein that seems a bit lighter than the others. Rather than doing the alternating skeins trick, I cast on the garter stitch border in the lighter yarn and then switched to the darker majority once the body of the sweater was begun. 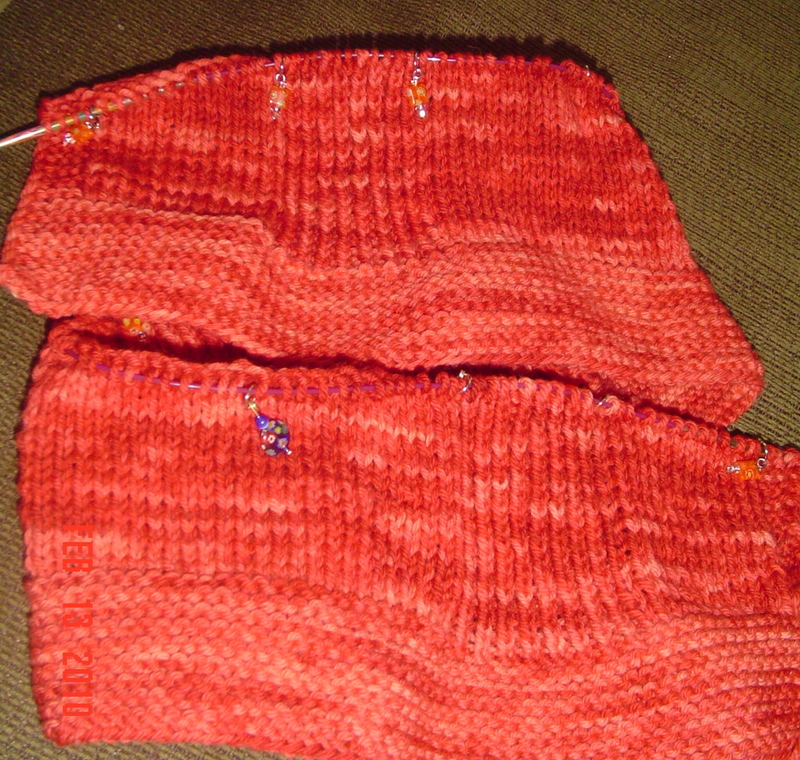 I will then do the same for the cuffs, which are 5 inch long garter stitch cuffs. I think this will help it blend together. Only time will tell though if we get obvious skein changes. Our solution? 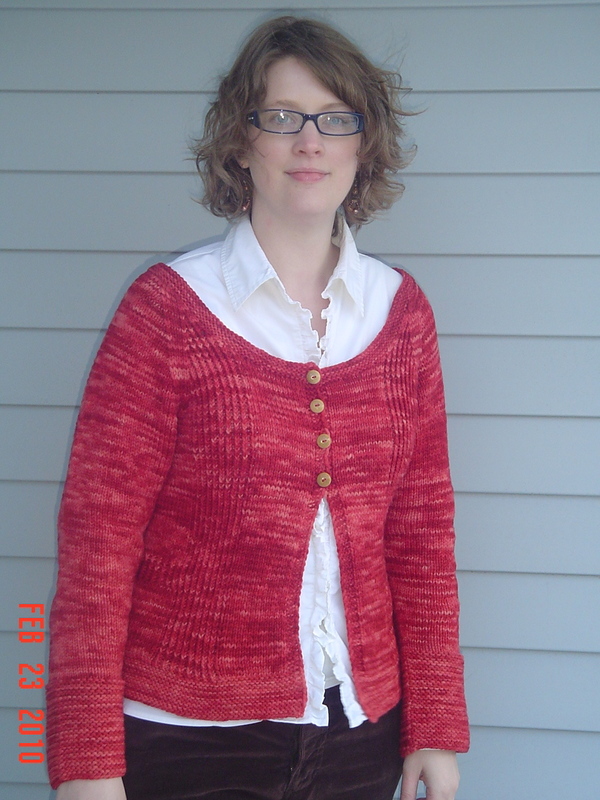 If we do, we figure we will just overdye the finished sweater a bit darker red. The picture does not do the red justice. I am really liking how it is currently turning out. In true to me form, I am of course doing this as a knit along. Someday I will have to explore why I am so apt to work in a KAL capacity. Anyhow, Ummeyusuf is doing this one too, we have had it in our sites for quite some time now. My other goal is to be posting progress pictures almost daily. I’ve not been so good about blogging lately, mostly because there hasn’t been much to show off. 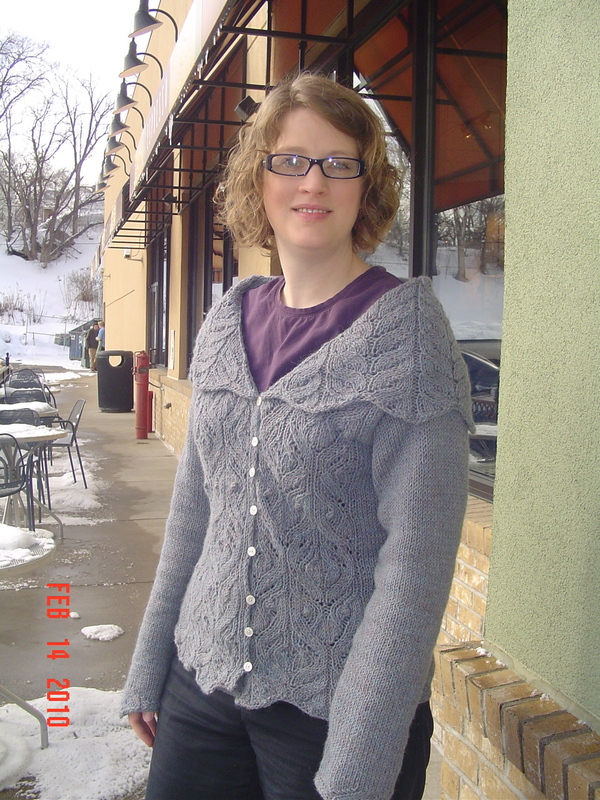 And it may be fun to see just how fast I can knit this up. I need to be putting in a lot of time this weekend on it, because as soon as I head back to work, I will have very little time to progress.